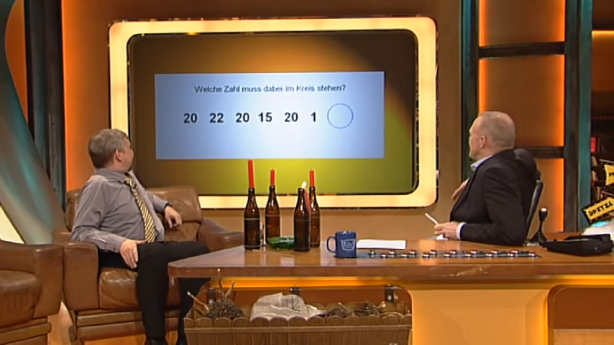 A few years ago, German late-night show host Stefan Raab presented a number puzzle in his show “TV total”. It involves cryptography and should be easy to solve for readers of this blog. 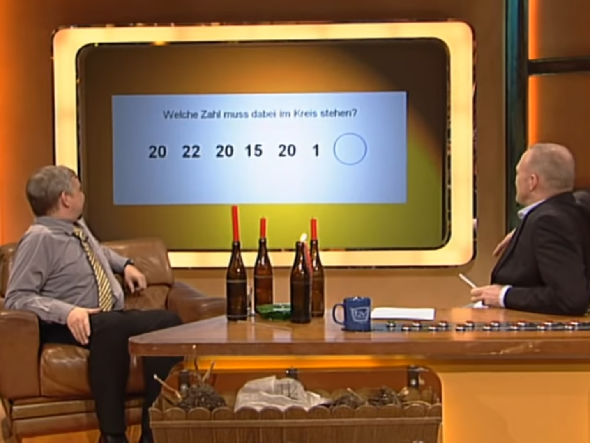 German readers certainly know the late-night TV show TV total hosted by Stefan Raab, which aired from 1999 to 2015. A few days ago, I happened to watch an excerpt from a 2013 TV total episode on YouTube. 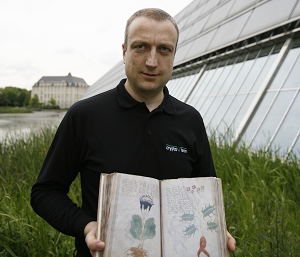 This episode shows an interview between Raab and Thomas Wolf, who is described as one of the nine most intelligent people in the world. Wolf’s IQ is nearly 200, so he belongs to the Giga Society, an exclusive super-smart club. Can you solve this puzzle yourself? The sequence of numbers presented is 20, 22, 20, 15, 20, 1, ?. Can a reader solve this one? Knowing that the challenge has to do with cryptography makes things easier. If you find the solution, post it in the comment section. If not, watch the video or wait until somebody else has posted it. 4, 11, 25, 53, ? That’s the problem with IQ-Tests, there are often alternate solutions, here with the same result. Which one is more intelligent. I had examples, where the test says my answer was false, but it had to be correct. IQ-Tests are arrogant, because they think they have the only existing solution. I am intelligent enough, that I will never create a test, because it is very thin ice. 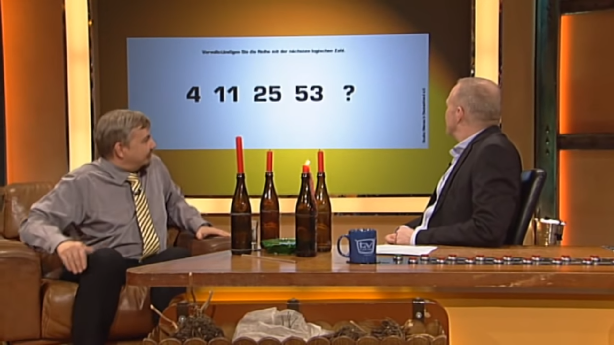 Mit der Nummer mit den Nummern war ich selber vor 24 Jahren mal im Fernsehen (“Aber Hallo!”, RTL). Hat mir damals 7’000 DM eingebracht. “tvtotatG”. Maybe “TVTOTAL” = 21,7,12,25? 12 – das L, das Ganze heißt TV TOTAL und die 20 ist der Index des Bustabens T im Alphabet, die 1 steht für A usw. jede Zahl ist einfach die Position des jeweiligen Bustabens im Alphabet. I added first set to get 42, subtracting it from the next set of 35, gave a 7…I applied the sequence again to see if a pattern emerged, and instead of a 7, I got double(or rather current num value added to previous) 14 value, so I figured expected value would be +7 more, or 21. Not sure if that’s correct, or close, but like someone else said, there are likely many answers. In this case we formed a reasonable way to carry on the progressions given the value set so following our pattern we get 21 as our first set….and we also get 7+7+7 (21) as the expected value, but lacking the next set of numbers we would use to continue the pattern, my example stopped at 21 minus an expected value of X, or set of X…Lacking data, looks ok…cause x is ok with being X, with or without “sets” that it may or may not ever need or be using. Which means we may also conclude that the sign as well could end up not as 21-x=21….which assumes the negative is confined to stay with X, but it looks as if the abs value could jump logically to the first sets additive value being negative in place of the value X, especially since the value X is passing what could be the value X in any given direction of movement…. 4 11 4 3 4 1…..Or 200, 60, and 4! But that’s not a time, times and “half a time”………Everyone knows that’s 60, 1, and ¼. ! !